Raabia Hawa is a woman on a mission. 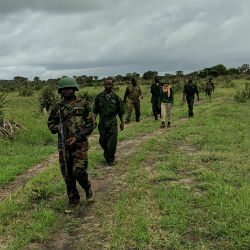 She gave up a successful career in TV to work with rangers in the field in Kenya, and founded the Ulinzi Africa Foundation – East Africa’s first NGO to raise awareness of the challenges faced by rangers in their fight against poaching. 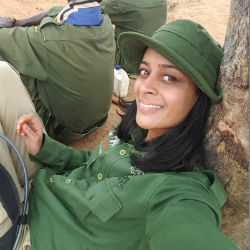 Raabia now has more than 10 years’ experience in the field – a life that can be incredibly tough, but also immensely rewarding. Foot patrols will start around 8am and last all day, with the team “tracking, listening out for sounds of human activity, chopping or talking, and also taking in and identifying any out of the ordinary smells such as burning or rotting flesh”. 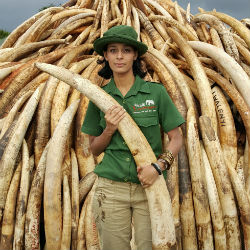 Born Free's President and Co-Founder, Will Travers OBE, says Raabia is an "extraordinary person". "If you have any doubts that this seemingly fragile young lady is anything other than hard as nails, I can tell you she puts herself in some of the most remote, difficult and challenging environments because she cares," he adds. "She is one of my wildlife heroes."